2P START! Live! 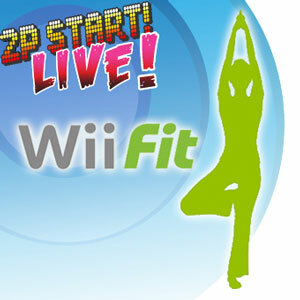 : Wii Fit Edition | 2P START! In this edition of 2P START! Live! we discuss our new weight management system, Wii Fit! Ray needs to gain a bit of muscle and I could stand to lose a bit of fat. Most importantly, my wife Sarah joins us to discuss her experience with Wii Fit as well as her reaction to her first appearance in our comic. Enjoy! Also, I apologize for the late posting (as it’s a holiday) as well as the poor sound quality for Sarah’s portion of the podcast. We were sharing a mic and it didn’t work as well as I had hoped. I hope you can still enjoy it! First Post! (unless you count Tim, then it would be SECOND POST!!!) Not only Tim’s wife looks hot, she sounds hot too! 😉 ‘Virtual air’ sounds like some kind of videogame-related perfume/bodyspray/shower gel product… maybe I could try to cash in on that… Good podcast as always! From what it sounds like: WiiFit=Brain Age for your body, too bad there isn’t a large polygonal head of some Japanese Professor to guide you along. Sarah with nubby elbows is a freaky mental image. im seeing a Guy Ledouche cameo in the next comic! but ray do you turn off your console or push skip when the game credits come on??? My Wiifit is still in the box. Granted its hiding behind the couch and I have a snooping sister who is seeking it out. She has another two weeks to get it….is this torture? I thought I had last week’s trivia for you, well, I did have it right. This weeks…I can’t help but think it sounds like a remix of the store music for Zelda. ray do you turn off your console or push skip when the game credits come on??? No, I always stay through videogame ending credits as well. I only skip them if it’s my second time or more. Take Mario Kart Wii for example: the credits roll anytime you beat the Special or Lightning cups. So I watched it with pleasure the first time, and have skipped it ever since to avoid irritation. So Tim, what do you think of Ray saying he will have your wife anytime? They need to get the Wii-DS interconnectivity ramped up in games. Although, I can just imagine a game where you have the Zapper in one hand, a DS in the other and stand on the Balance Board. Some kind of crazy tilt-sensing, voice recognizing, squad shooter with overhead map on the DS and football-diagram style teammate orders. Wow, I had not heard the metroid movie rumor. That trailer would be SO awesome. Samus could charge a shot, walk through a tunnel, have light flash on the visor, jump out of the way of Ridley’s Tail, and then remove her helmet and have her hair billow out in sillouette. And come on, how can you even do a Rubik’s cube one handed? Or do you use one hand and anything else you want to brace it against? Or maybe you have this like super oiled cube? Good podcast guys, but a couple comments. First, I haven’t honestly looked into WiiFit. Played an import copy a friend of mine insisted I would enjoy because I was into EyeToy: Kinetic for a while (and Pump It Up before that) but couldn’t get into it. So it was quite disappointing to hear about the freerunning mode. Why? Well, I was hoping with all the controls and minigames officially raped from Xavix and slapped with a bigass Nintendo logo on the front, the last thing to remain would be the Jackie Chan Adventure Run mode which incorporated Xavix’s scale. Second, Konami attempted body motion with game controls in the past with their Mo_cap line. The experiment started with Fighting Mania which was, well, horrible but because it was Fist of the North Star themed, you could at least take amusement in exploding bloody heads. WooT! This later went into their use of IR sensors in their arcade lineup dubbed Mo-Cap which featured Mo-Cap boxing and Rescure 911 where players could lean to avoid bullets. It was great fun and the WiiBoard has that potential, but it won’t be reached. We are already seeing evidence of this in WiiSki where a 3rd party has basically said “Well, this is what Nintendo did with it, so let’s just focus on one part and make it better.” Further hopes were dashed with Don King’s Prizefighter on Wii. The game promised WiiBoard compatibility and instantly my hopes shot up with dodging and ducking punches and blows in a way I haven’t enjoyed since TeleroBoxer. As quickly as my hopes went up, they confirmed this ability will NOT be featured in the fighting, but rather training minigames. UGH! The potential is there and even if games do add the support (like Time Crisis), there are ways to avoid requiring the WiiBoard for that element. It still saddens me that the game I see living up to the promise of the Wii is actually Wii Cheer. Look at the videos closely and you’ll notice each arm is individually tracked. But damn, I do love to ramble so…. How the F can you solve a Rubiks cube with one hand? I can’t believe it until I see it. And I won’t believe that any particular person can do it until I see them do it themselves. Lwelyk should not be able to win anymore contests! *gasp! * Sarah sounds hot too! Hey! I think I’ve heard that voice before on one of those 1-900 #’s (J/K Tim, don’t kill me please). I will not be buying Wiifit, would more than likely be a novelty for me, and I don’t need my mother taking my Wii either. I still haven’t gotten my Okami sleeve replacements >_< . I for one was said when E-102 Gamma died in Sonic Adventure 1. Very sad story. Hey, you guys still haven’t done anything for the “Name-that-game” winners. You two should get on that……. I refuse to see anything by Michael Bay since he turned Transformes into Dawson’s Creek. The point on movie trailers is 100% true, I don’t judge movies by thier trailers any more. Yo Ray, I think it’s just implanted into people’s minds to leave the theatre once the credits begin because that’s the usual signal that the movie has ended. I for one get the urge to leave the theatre out of pure impulse when the credits start. Every Rubic’s cube I have used took incredible strength to turn. I still say it is extra well oiled. Ok, that was… awesome. Guilherme needs a complimentary floating 2pstart head. What about 3rd place Mario Kart Friend Tournament winners? OK, I was willing to overlook that the Black Doom Award was basically a rip-off of The Lame List. But now Ray has actually recycled one of my very own Lame List nominations (people leaving the movie theater as soon as the credits begin) from way back on the August 26, 2007, episode of The Lame Show. I think Ray should receive a Black Doom Award for that.